When we first bought our house three years ago, we just used what we had to decorate. Partly because we were broke, and partly because I wanted to let the house evolve over time. We were guiltiest in the guest room- we moved in, we plopped furniture down, and we moved on. Guest Room Before = boring…snooze…yawn…blah…and it sat like this for about 3 years. The room started coming together with some paint, a couple thrift store scores and rethinking some furniture placement. So, I know we are about 9 states away from Cape Cod, but just imagine a seaside town out that window filled with gable-roofed, gray-shingled houses. Quaint beaches with historic lighthouses. A coastal shoreline with rustic docks and dunes for miles. OK, you seeing the vision? Can you imagine this as a room at a bed and breakfast in Nantucket? We had the walls painted Mindful Gray (one shade darker than the rest of our house, Repose Gray) and while I love the color, it really washed out the room. 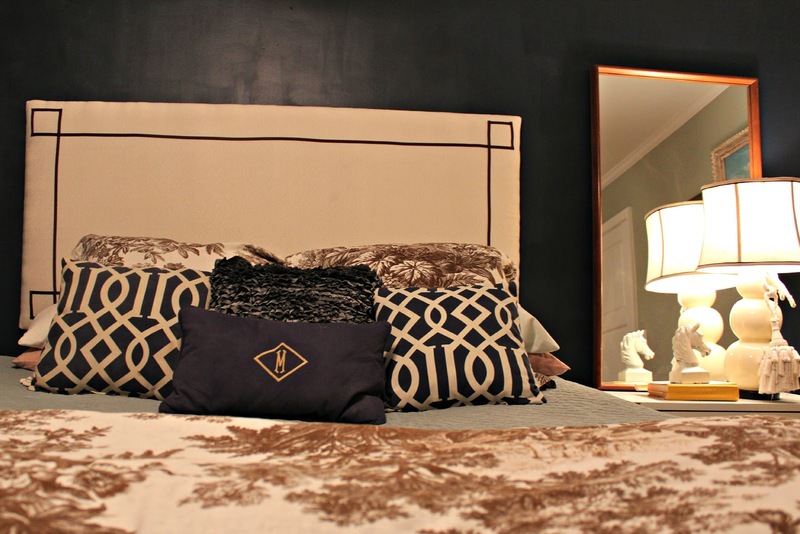 After a long debate with myself, it was decided that a dark navy accent wall would really help anchor the space. (Navy is kinda hard to get right- what color isn’t!?!) 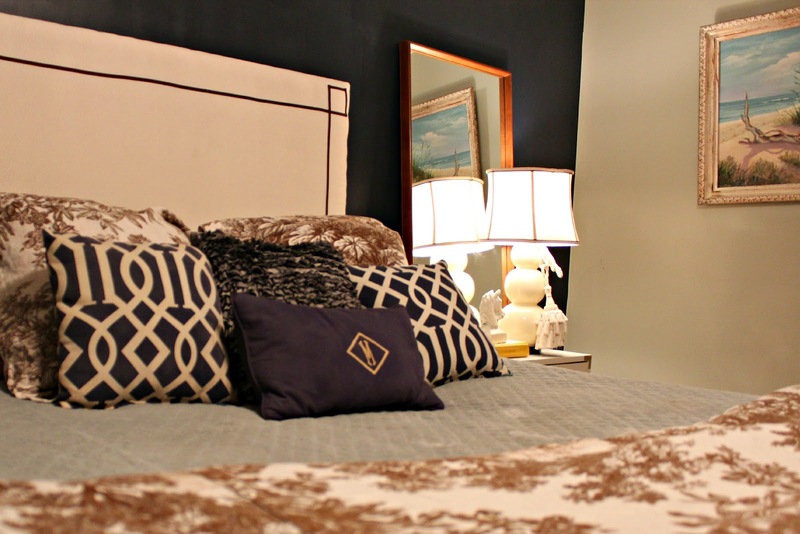 Went with Hale Navy (Benjamin Moore) and I love it! Also, since I gauge ease of project based on child nap time required, this one took me two naps over one weekend, or about 2.5 hours. Best part? $5 sample can did the whole wall! Big bang for small bucks. Next up was reworking the nightstands- read here for more detail on my “Campaign for Neutral Campaign Furniture”. 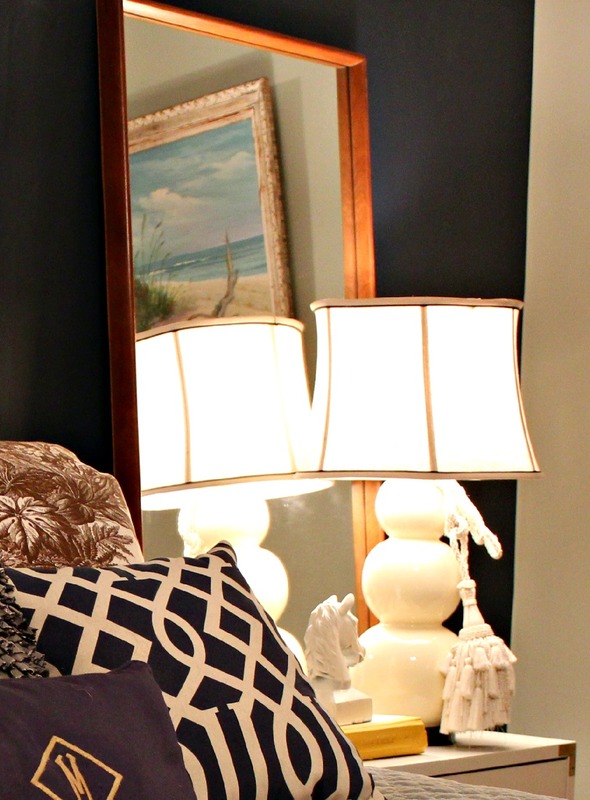 The creamy white campaign nightstand brings some glam to the space. The other big furniture change was moving the antique chest of drawers to the back corner of the room. This piece of furniture has quite a story. When living in Orlando, I stumbled it across this chest at a dumpster on my way to work. Yes, picture me fully decked out in work clothes loading this monster into the back of my car all by myself, heels and all. 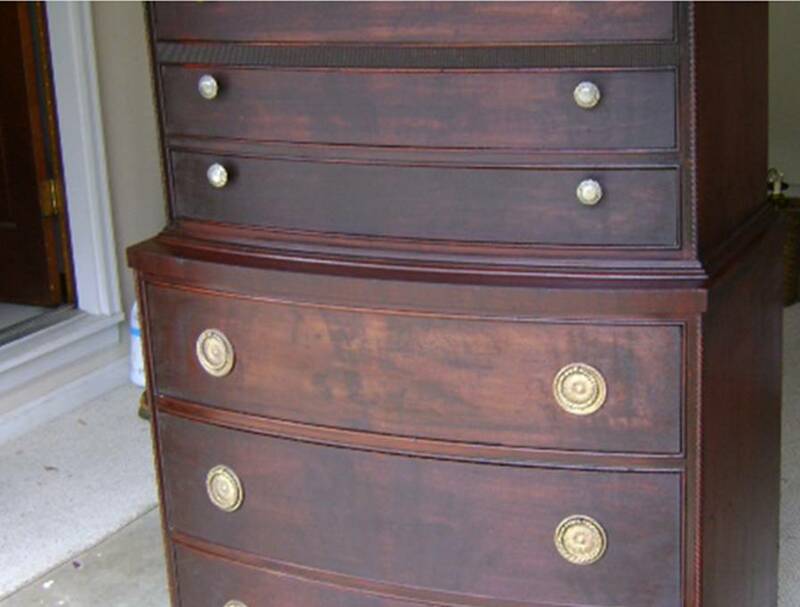 When I found the chest, it was a sight for sore eyes- the drawers were broken, the wood needed refinishing, some knobs were missing. But I can’t take all the credit for salvaging this beauty from the dump, the true hero here is my dad- he fixed it up like the MacGyver he is, and it one of my favorite pieces of furniture we own. Can you believe that someone was sending this lovely to the dump? OK, so that takes care of the big pieces of furniture. I think the brown toile really gives a Nantucket feel to the space. 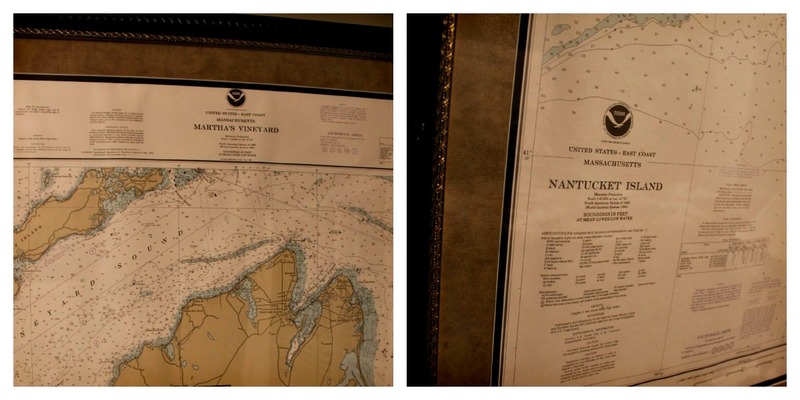 These two framed oversized maps – one is Nantucket, one is Martha’s Vineyard. The price? $50- for both. Not kidding, would I kid about something this lovely? Yes, I was giving virtual high fives to myself as I dragged these out of the Goodwill. Here are a couple more shots of the room. 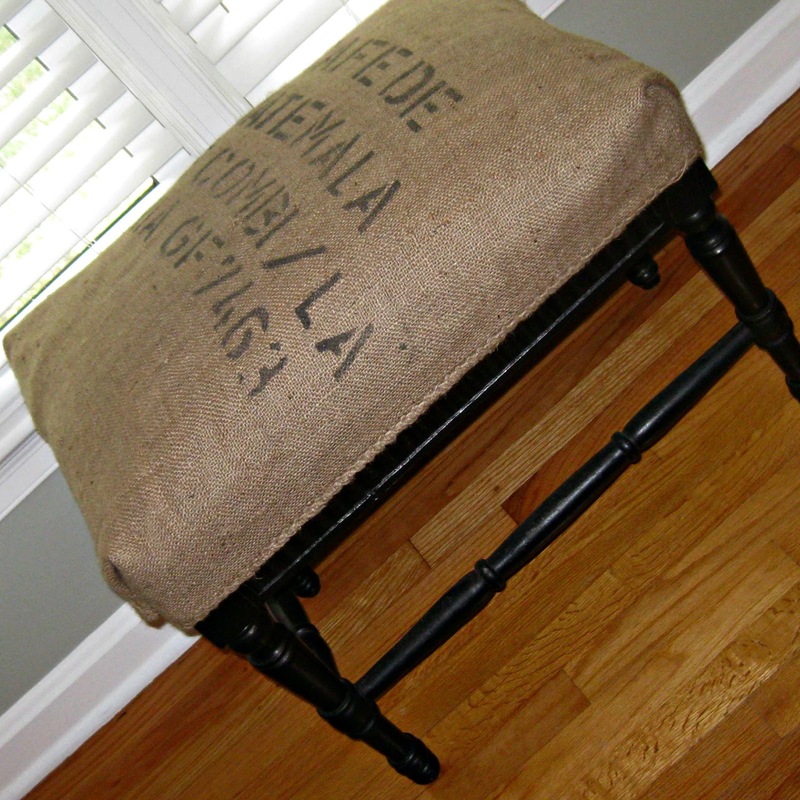 A quick recovering of an old ottoman with a coffee sack purchased at Scott’s Antique Market here in Atlanta gives it some new life and fits the room much better. My mother in law gave me that great driftwood painting and I am officially in love. So I have been on-the-hunt for more and so far I have added the other two to the collection. Oh Goodwill, how I love thee. Let me count the ways. What do you think? Are you in a Nantucket “State of Mind”? 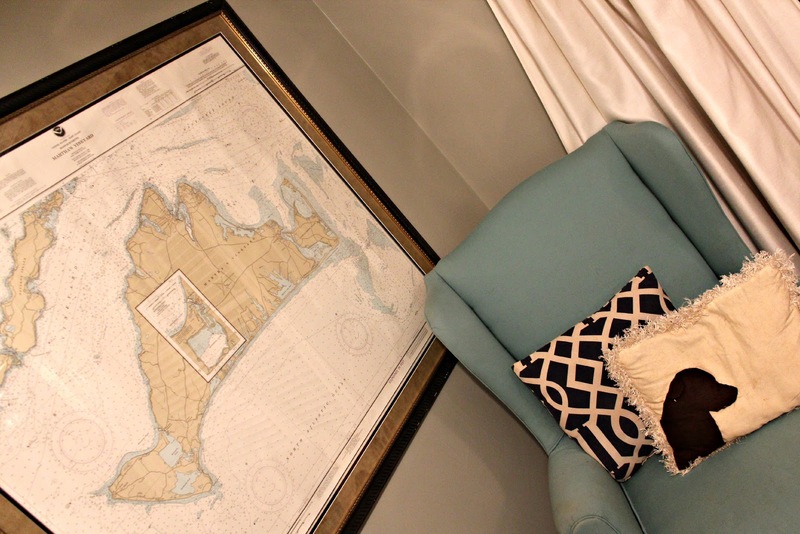 Do you want to take a trip to Cape Cod after seeing this space? I love the look of this room. Yes, it is amazing how the dark color on the wall anchored the room. I too love rooms to evolve and your layered look is just beautiful. Your guests will not want to leave! I love the changes you made. I also love Nantuck design and think my home has a mix of this and industrial/farmhouse throughout. Your space turned out great!! Great transformation and I love the puppy silhouette pillow! Just linked up! Thanks for the invite! Beautiful room. I would love it if it was my master bedroom let alone a guest room. So fabulous. I would love it if you would share this over at my link party. This room looks great! 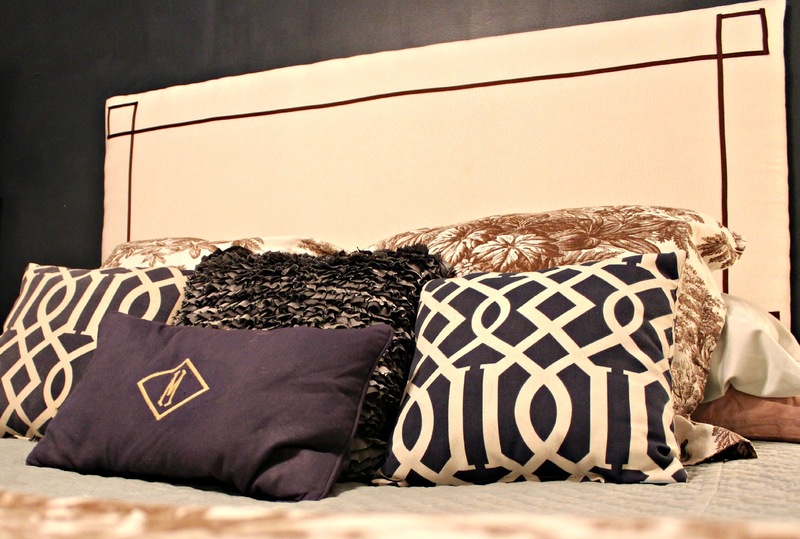 I really need to spruce up my guest bedroom. It is such a hodge podge right now! Thanks! Off to check out your blog now! Thanks! I am a sucker for maps and burlap! You did such a great job! I love finding treasures from different places and putting a room together from it, I find some really great pieces at flea markets and just give them a little TLC. My husband and I are looking for Nantucket rentals and I always expect them to look something like this: relaxed and inviting. Keep up the good work! Thanks! Nantucket rentals sound amazing! wow, looks great – love those maps! Thanks for coming back this week to link up in support of Habitat! Love the contest you are running! Thanks so much! 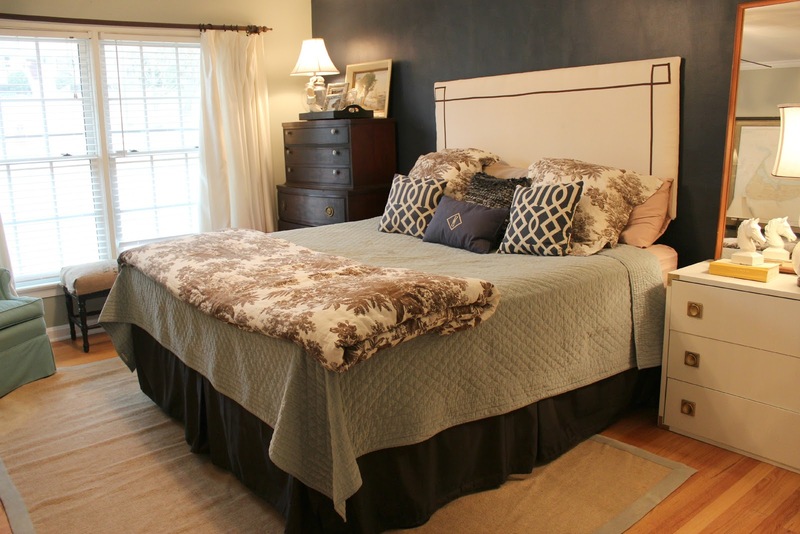 Love this guest room. i keep coming back to it to admire all the elements. Just can't get past the brown and cream toile–my absolute fave. Nine bucks?Unbelievable. I'd say some very lucky guests have a lovely place to sleep. Jude, thanks for your sweet message! I do love that brown toile, and I love the price tag even more! Thanks for stopping in!